1985. The 1984 campaign raised just over $5.5 million. 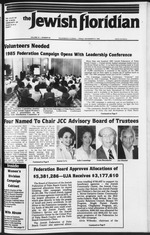 Federation campaign," said Mrs. Cummings and Lampert. Hanukkah candle on Dec. 1.8," Lampert added. received a total allocation of $315,250. = her novel, "Hungry Hearts,"
indoors and out," she said. Max M. Fisher in Palm Beach. For more infomnw"
1 u d'e, lne cr*" in determining gift giving. Council meeting with the officers of the Jewish Federation. High Ridge Country Club Golf Tournament chairman. Mi and Barry Berg, chairman, Business and Professional Division. 5 Royalon'theG M Mlrm"' Women's Division president vke president, Edncadon. the Lebanese in May, 1983. And then. promptly, the whole thing was cancelled. Operation Peace for Galilee in June. 1982.
are a case in point. continue to play their hide-and-seek. game. would return to the talks begun last week. emerge as a nuclear power. POSTMASTER: Send td*u cftanoas to The Mm%U* Flondan. kind of fear since the days of Sen.
McCarthy ism in our time. for national hope that the Reap"
played in the Wallenberg case. half of 1984, to $23.8 billion. of Palm Beach County-United Jewish Appeal campaign. B & P. were the speakers at the briefing session. ^^HrplMiMMHiiitlM'rstii-k-Mi for your u-lephone rtteiwr. Ihmh-.iiih" "iiiiMiniKun^Siis M.7MI M I Ml iiMWtl,\"liU>lll ii|irjiniiiil|nii i|Min:H"nil.iluiiir.illinit. Haifa Lodge's regular meeting will be held on Sunday. Ave. and North Federal Highway. B> reservation only. Call Sy Fine. Emeth. 5"80 W. Atlantic Ave.. Delray Beach. FL. Action Division against cults and missionaries. I, New Year's Week fro 3ei;r. ana. r's Week< k 29-Jaa I t three . Beach Breakfast will be served. will present a musical program. oa A1A acar Lake Worth beach at 11:30 a.at. oa Monday. country. and to families alike. Quality Kosher Catering in all. Be involved in building this community! Stevens, Lewis Powell, William Rehnquist and Sandra Day O'Connor. Donnelly but also YVidmar vs.
hands in a gesture of Franco-German reconciliation. costliest battles in world history. been a matter of course. it: "We have become friends." customs checks at their borders. rail passengers are now takes. I land I rankfuncr Allgcmtint /titung. form a new German nation-state. and Prague supported this line. out of the Warsaw Pact convoy. put on the agenda in the West. mare, of a reunited Germany. abeth S. Shulman, Leah Siskin, Dr.
Palm Beaches, Dr. Klein said. On The Heights in Cleveland. Jewish Federation Board of Directors Meeting 8 p.m.
1 p.m. B'nai B'rith No. 3196 board 7 p.m.
Israeli Folk Dance 7:30 p.m.
without notice. Certain restrictions apply. Contact your travel agent or El Al for details and fares from your dry. Blum has chaired the event. Institute in Big Pine Key, Florida. members. A $50 deposit must accompany a reservation. books, games and various toys are available. |n of Rabbi and Mrs.
like you doing in court?" the fathers and 'survived,' "
to turn to him or her. , made great sport of. Inever give up disturbing me. rs of the Peace Foundation. mize. I know their work.
) is careful not to say. never know which one of these. when it is not a Jewish cause? Karoun, on the eastern sector. Kevin Wagner, son of Dr.
24, at Temple Beth El. Sarah Levine of Lake Worth. idents of West Palm Beach. West Palm Beach 33409. PHone 684-3212 tuHJ*? Vander Walde. Cantor Mordecai Spektor Dailyil'" . p.m., followed by Oneg Shabbat. Saturday 8-30 ? Gardens 33410. Phone 694-2350. Rabbi William Mark! Cantor Earl J. Rackoff. Sabbath services, Friday 8 n.
857146. Port St. Lucie, FL 33452. Friday night services 8pm. West Palm Beach. Mailing address: P.O. Box 17008. " 6164 Okeechobee Blvd.. West Palm Beach. FL 33409. PM"
L**Social Hall, at 315 N.
organizations in the community who request their services. Tuesday, Nov. 27, 12:30 p.m.
No. "A" St., Lake Worth. Funeral Home. Wett Palm Beach. steln Guaranteed Security Plan Chapel. intentions plenty to talk about. Bonn and East Berth i"
which critics i both S? harbor a blind urge for relj. the will of other nations. - 1 p.m. B'nai B'rith No. 3196 board 7 p.m.